POWERTWIST Move SuperGrip Top PVC incorporates an ultra-high grip, extremely pliable top layer. Its soft PVC compound surface provides superior traction and belt life in tough applications. Packaged in 100' lengths. If ultra-high grip and an extremely pliable top are what your application demands, POWERTWIST Move SuperGrip Top PVC is your solution. 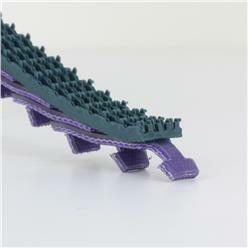 This compliant top surface is attached with a proprietary “adhesive free” bonding technology that will not delaminate. Minimum Pulley Diameter: 200mm, 8.00"